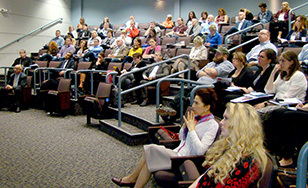 The College will host the sixth annual conference for the Socio-Economic Approach to Management, or SEAM, from 9 a.m. to 5 p.m. on Thursday and Friday, May 3 and 4. Sessions will be in Somers Main Lounge on campus. About 100 attendees are expected. SEAM was developed over 40 years ago in Lyon, France by Henri Savall and his colleagues. Unlike traditional management practices, SEAM factors both people and finances into analysis, and is based upon the principle that poor employee productivity is largely due to how employees are managed. While SEAM is well established in Europe, it is still rather new to the United States. St. Scholastica is one of only a few colleges in the U.S. that teaches about this management approach. The College offers a study abroad opportunity about SEAM in Lyon for graduate business students. The conference presenters will include founder Henri Savall and members of the Institut de socio-economié des enterprises et des organizations, as well as leaders in the SEAM field in the United States, including several St. Scholastica faculty. This year's program will focus on healthcare and will include presentations on the theory and practice of SEAM, comparison to other management theories, and case studies. A social hour will follow Thursday's conference at 5 p.m. at The Boat Club's Harborview Room in Duluth.